Changing your password every so often is always a great idea. 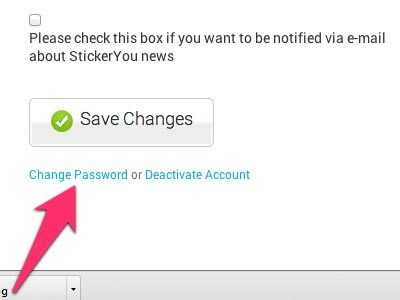 Here's how you can change your StickerYou password. First, log into your Account by clicking on "Login" in the top right corner of the screen. Then, hover over your name (where 'Login' used to be), and click "My Account". Near the bottom of the "Account Details" page, under the "Personal Info" section, click on: "Change Password".